Dang, that’s a nice campus. Harvard University’s Kappa Alpha Theta sorority is going gender-neutral in response to new sanctions imposed on single-gender social clubs. The women-only group announced on Monday that it will break with its national organization to become the co-ed club Theta Zeta Xi, according to The Harvard Crimson. The College’s sanctions—which took effect with the Class of 2021—bar members of single-gender final clubs and Greek organizations from holding student group leadership positions, varsity athletic team captaincies, and from receiving College endorsement for prestigious fellowships. The club is just the latest of several Harvard-adjacent single-gender groups to go co-ed. In January, the sorority Kappa Kappa Gamma went gender-neutral. Last year, two fraternities and four single-gender social clubs opted to go co-ed. 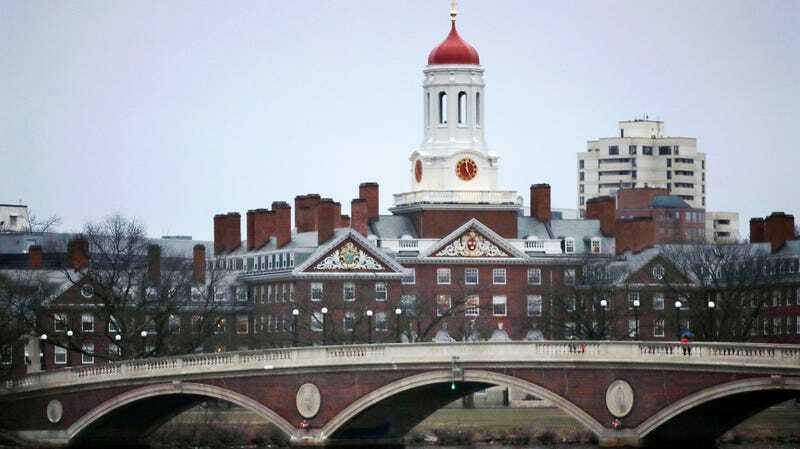 The Harvard Corporation, the school’s top governing body, has characterized the penalties push as a way to recognize “that students who serve as leaders of our community should exemplify the characteristics of non-discrimination and inclusivity.” But it’s also been fueled by concerns over behavior among men-only clubs in particular. As John Sedgwick wrote last year in Vanity Fair, the administration’s rhetoric heated up after “a risqué account of final-club party antics appeared in Elle magazine in November 2015, written by a female Harvard graduate who had participated in them.” That account included such details as a naked-lady ice sculpture with “enormous” breasts (“if you crouch beneath her thighs, you can guzzle a shot of Rubinoff vodka that a hoarse-voiced senior will pour for you down her icy frame,” wrote the author, Mattie Kahn). “Soon it was open season on the final clubs as places of Rabelaisian debauchery, where unsuspecting (or even suspecting) women were defiled for male sport,” wrote Sedgwick, who in hyperbolic male journalist fashion compared “the anti-club campaign” to “the second Iraq war” (something about the mission shifting with the facts). Hire a Sorority Rush Consultant If You Can&apos;t Get in Yourself...?